Today I got my third Christmas card of the year and the first Christmas letter was tucked inside. It got me thinking, maybe instead of doing my Top Things list that I’ve done thelast few years, I might just do a quick overview of the year instead. Since single ladies don’t usually get the chance to do splashy year in review letters with their photos and all that jazz. For the most part, 2013 feels like it’s been another in-between year. A year where a few exciting things happened but no major life changes (moves, job changes, etc.) did. My year started out with a bang, toasting with coworkers at a party here in Joetown. I feel like I’m kinda awkward in this photo. Yay for hanging out with near-strangers and being way out of my comfort zone. Then, I decided at the very last minute to go to D.C. for Obama’s second inauguration. I found out about a week ahead that a good friend was going to be in the region and we went together. It was so fun and not too cold and we even heard Beyonce lip sync. But that is the first time to my knowledge I was within a half-mile of Queen Bey. There was kind of a lull through the next few months, but in March, one of my old friends/roommates got married. 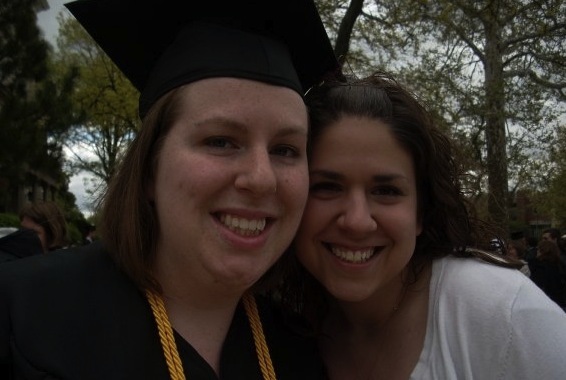 I’ve known Dawn since my freshman year at MNU, pre-Olivet transfer. I’m really glad I could go, since it was just over the state line in Kansas. A month later, I made my TV debut, producing a package at work for my newspaper’s adjoining TV station. 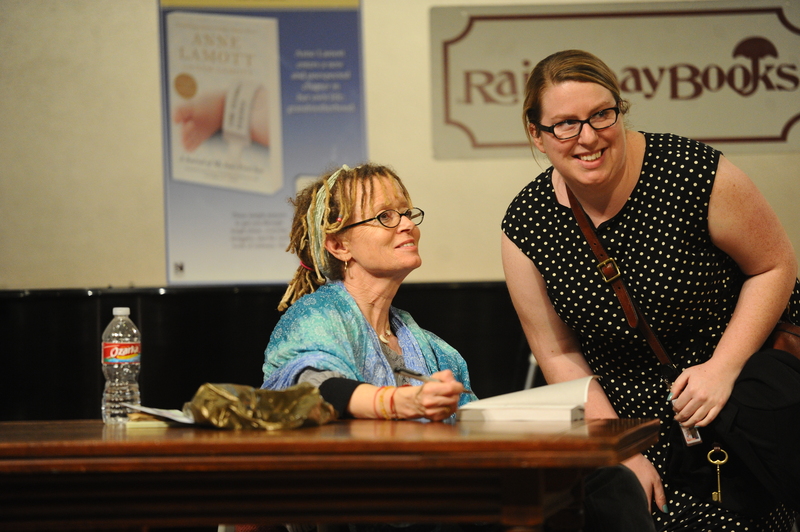 The same day it aired, I met an author I’ve long admired: Anne Lamott. It was great. I wish I could have seen her talk that night prior to the book signing but work held me up late. A photo of me and Anne posing for a photo. Creeper shot by my friend Matt. A few weeks later, I did my first (and only to-date) live shot with the aforementioned TV station. I was standing on the narrow shelter of a two lane highway talking about a crash and it was kind of traumatic, but hey, it was over pretty quickly. April was kind of a crazy news month, actually. A big story I worked on about a kid peeing a teacher’s lounge coffee pot went big locally and was poised to go national until the Boston Marathon bombing happened a day later. June saw two great weekends in Illinois, partying it up at my best friend’s bachelorette party and then going to her wedding. I spent both weekends seeing my grandparents, too, as well as my good friend Rachel (she was my +1 at the wedding) and great friends from Morris. It was the first time in Morris since I’d left. It was weird being back (felt like nothing had changed in a way) but it was fun getting together with my friends there and laughing so hard. I really am blessed to have amazing friends, wherever they are in the world. July…I went to see the Postal Service. Mates of State opened, but didn’t play any songs I knew. Ben Gibbard=amazing. I went to yet another wedding-related event (the 5th of the year): a wedding reception for another old friend. September…I started covering a federal case involving a local police detective. And found myself a federal inmate penpal/source. October…I covered a national story happening in our backyard. It got kinda crazy. November…I went on a last-minute business trip to D.C. for a story. It was amazing and a such a God thing the way it all worked out. Even when I didn’t think it was going to come together. Going back made me realize how much I miss it…and also how maybe I might be able to come back one day. I’m kind of coming up with a new dream. Stay tuned for 2014. I also went “home” to Indiana for Thanksgiving and it was a much-needed trip/time off. And now it’s December and I have hit my one-year at work and my apartment and I’m really not sure where the year has went. It’s kind of crazy. The other day, I was wasting time on Pinterest when I saw a pin quoting Zora Neale Hurston, “There are years that ask questions and years that answer.” For me, this was a year of questions: What is God’s purpose for my life? What’s next? How can I live in my dream city? When will it be my turn to find a significant other? I’m hoping 2014 will be a year of answers, of feeling more settled and a little less restless. Here’s to hoping, at least! Whoever is reading this, wherever you are, I hope you’re having a lovely holiday season and have a wonderful, healthy, adventure- and love-filled 2014.